We know that the grey skies and cold temperatures we’re experiencing might have you wanting to pack your bags and run for the nearest beach, but it might be time to try something new. We suggest heading for a ski resort instead since you’ll have a reason to buy stylish winter gear and cuddle up with a cup of hot cocoa and snuggle with bae in front of the fireplace. Here are seven ski towns you’ll want to run off to for a winter rendezvous. The city of Telluride is known for its charm, and diverse terrain makes it a great ski town for the inexperienced and well-versed skiers. With 9.3 out of 10 rating on Booking.com, The Hotel Telluride is our pick if you’re planning to head to the Colorado town for a winter adventure. Located in the Laurentian Mountains of Quebec, Canada, the year-round resort town offers stunning views, ski lessons, and a “not to miss” panoramic gondola ride. One of the other perks of visiting the Mont- Tremblant is that kids 17 and under stay free when accompanied by an adult, at participating hotels. Vail has become one of the most popular ski resort in North America. With 200 trails across nearly 6,000 acres of terrain, Vail is a favorite of snowboarders and skiers alike. If you’re looking for a luxe experience ski experience, look no further than The Sebastian. With beds made with 400 thread count Egyptian cotton sheets, an outdoor fire pit, and residential suites filled with a full kitchen, dining area, and a gas fireplace — you’ll feel like you’re at your home away from home. As the number one ski resort in Japan, Niseko offers an assortment of lodging options as well as activities like cat skiing, snowmobiling, and snowshoeing. Niseko is located in Hokkaido which a 2.5hrs drive from Chitose Airport. Courchevel is nestled in the French Alps and is a part of the Les Trois Vallées, the largest linked ski area in the world. Courchevel isn’t just known for its renowned slopes, but the city is also known for having one of the shortest runways in the world. If you have a fear of heights or flying, this may not be the resort for you, but if you’re up for facing your fears, be sure to book a room at the Mercure, as it reviewers say it is one of the most accessible locations to ski in and out of. Surrounded by four well-known ski areas: Aspen Mountain, Aspen Highlands, Buttermilk, and the Snowmass Ski Resort, the small ski town offers a lot of a variety of options for winter sports lovers of all experience levels. Five-star resort, The St. Regis Aspen is known to offer one of the best service experiences in town. Many of the world elite visit the slopes of Lech each year, and we think this exclusive resort should be on your list, too. The ski town is located 90 miles away from Innsbruck and two hours and 15 minutes from Zurich giving travelers two airport options with access to the city. 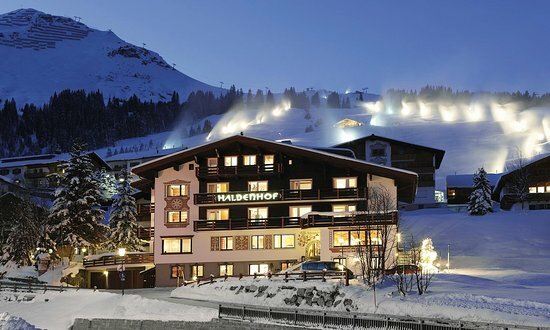 The family-run, Hotel Haldenhof features cross-country skiing tracks, a day bar with an open fireplace, and is just under 650 feet from both the Rüfikopf and Schlegelkopf ski elevators.